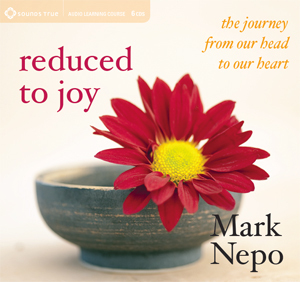 Mark’s new book explores how the soul works in the world, and how by engaging our soul in the world, we are shaped by the endless practice of becoming the person we were born to be. To bring who we are out and to let the world in is a brave and endless practice that clarifies and solidifies the gifts we are born with. These chapters explore the difficult and rewarding aspects of being human, which are often inter-related, including how to restore our trust in life, when suffering makes us lose our way; how to begin the work of saying yes to life, so it can enliven us; and how to make our inwardness a resource and not a refuge. By unfolding topics such as “Exhausting the Struggle,” “Staying in Relationship,” and “The Sweet Ache of Being Alive,” Nepo continues to reveal how the covenant of being and the practice of becoming strengthen both the inner life of spirit and the outer life of service in the world. 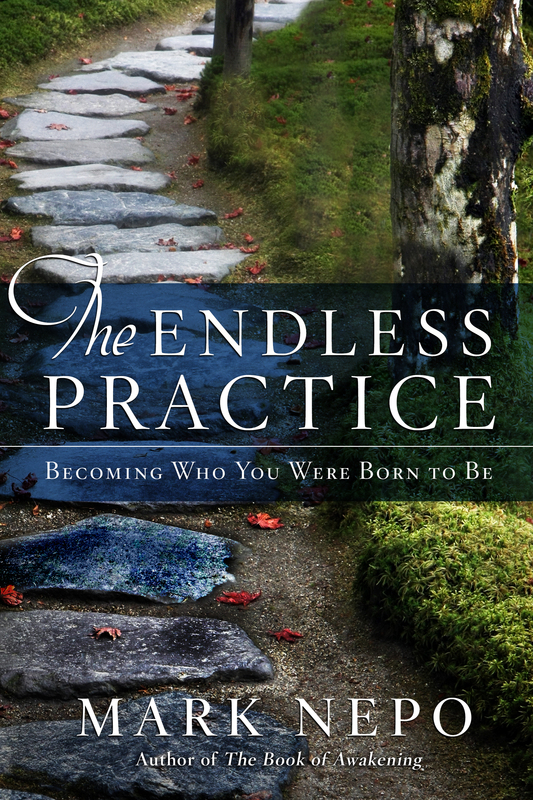 The Endless Practice is filled with universal insights and stories woven with guidance and practice, which will bring the reader closer to living their life to the fullest. During the last eight months of my father’s life, he was in and out of hospitals and rehabilitation centers. I had flown in to see him again. When I arrived, he was sleeping and my brother said he was having a hard day. I sat by his side. When he woke, he didn’t know who I was. This had never happened before. I was stunned and it felt odd and evacuating to have my father stare with enormously wide eyes, as if I were a stranger. My heart began to sink. I thought, So this is what it will feel like when he’s gone. I took his hand and tried to remind him, “Hi Dad, I’m Mark. I’m your son.” He looked at me like an old miner trapped underground. He looked at me as if to say, “Am I still here? Are you here to help me?” My heart began to tumble in this canyon between us. But it was suddenly clear that in this moment, I had to be a kind stranger. Later that night, he knew me again. But this was a humbling episode in which I was challenged to feel the unnerving moment that I was erased from the consciousness of the man who fathered me and to enter a reality that existed beyond my feelings, my story, or even my life. Without denying either. It was also a deeply personal moment of knowing that all things are true. This was my father, the man who held me as a boy, who cried but didn’t show up when I had cancer, who was lost to me for fifteen years, who cried in my arms when he was ninety, who didn’t know I was his son at ninety-three. All of it is true. And it’s imperative not to choose between them, but to let the many faces of my father wash into the many sides of his son’s aching heart. 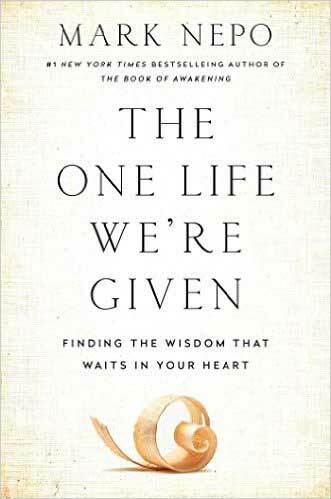 What I’ve learned from these passages is that the heart not only has room for both, but that life demands that we embrace both what is particular to each of us and what exists in mysterious complexity beyond our singular life. I’ve learned that the bird must feel both its broken wing and the current of wind that lifts and twirls and carries it. This is what it means to be a bird. As a person, we must feel both the break in our heart and the current of life that lifts and twirls and carries us. This is what it means to be openhearted. Completed in 1826, Opus 131 was considered groundbreaking, offering seven movements instead of the traditional four. Beethoven’s compositions for string quartet rush players into dynamic and intimate relationship, the way we can only know the wisdom of experience through actual relationship, learning how to play the music of life together. This is the inspiring lesson of Beethoven’s Opus 131: it mirrors the non-stop demand of life to have us make music of what we’re given, not knowing what will happen next. Inevitably, having to play seven movements without pause, the instruments will go out of tune. With no time to re-tune their strings, musicians have to adjust and improvise within the structure of the music. In this piece, Beethoven insists on allowing both the harmony and discord of life to be present. He challenges musicians to see the movements through, even out of tune. Likewise, we are challenged every day to say yes to the movements of life, to see it all through, without pause, staying in relationship to the music of life and each other, adjusting as we go, not knowing what will happen next. Yet even out of tune, this messy and magnificent practice, so essentially human, will let us hear—briefly—the music of the Universe being the Universe. To hear this larger music while grinding out the smaller music of our lives is what sages of all traditions have called glimpsing eternity. 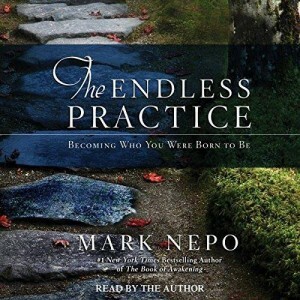 Question: What do you mean by the endless practice and what does this have to do with becoming who we were born to be? 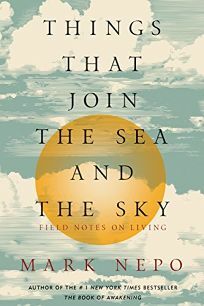 Response: This book is an inquiry into how the soul works in the world, and how by engaging our soul in the world, we are shaped by the endless practice of becoming the person we were born to be. From the moment we open our eyes, we are meaning-seeking creatures, looking for what matters though we carry what matters deep within us. And more than the hard-earned understandings we arrive at, more than the principles or beliefs we stitch together out of our experience, how we stay in relationship to the mysterious Whole of Life is what brings us alive and keeps us alive. Everyone knows firsthand that life is messy and painful, beautiful and unpredictable. The endless practice is keeping our heart open to the whole of it. And the journey of becoming who we were born to be never ends. It’s limitless, eternal. We don’t arrive—we grow. Question: In your opinion, what is the relationship between the soul and the world? Response: I believe and give my heart to the notion that spirituality is listening for and living into the soul’s place on Earth. A life of spirit, regardless of the path we choose, begins with a person’s acceptance that they are part of something larger than themselves. The want to know who we really are and to know the truth of our existence and our connection to a living Universe is, to me, the fundamental life-giving question that the heart commits to once opened by love or suffering. How we are led and pushed to our true nature is what spirituality and personal growth are all about. At the heart of each spiritual tradition are the questions: how to be in the world without losing what matters, and is living an awakened life of any use if we don’t bring what matters to bear on the world? Though every path offers some form of refuge, the journey of every human being is to discover—through their personhood—their own living relationship between the soul and the world, between being and experience, and between love and service. Question: You speak about the sanctity of experience. What do you mean by this? Response: The point of experience is not to escape life but to live it. Each of us carries some wisdom waiting to be discovered at the center of our experience, and everything we meet, if faced and held, reveals a part of that wisdom. We have a language of truth growing in our heart that only living can decode. The paradox at the center of the sanctity of experience is that while we can learn from each other, while I can quote these sages from across history and cultures as a way to affirm that we’re not alone, we are left to the magnificent journey of living our own lives. Question: One of the key chapters in the book is called “What’s in the Way is the Way.” Can you talk more about this? Response: One day, after bemoaning obstacle after obstacle in my life, it suddenly became clear that what’s in the way is the way. Facing the things that prevent us from making our way is the road of freedom we each must suffer in order to become authentic enough to follow the thread of what matters. Despite all our plans, learning to stay in our heart, losing our tight hold on our self, being made humble and gentle through the erosion of loss, and feeling empty enough to begin again—these are steps to finding and refinding the thread of all that matters. Often, we so furiously insist on what we want or where we think we’re going that we ignore, resist or deny what life brings as the next step. All the while, truth is a seed hidden in the days until watered by what life brings us. Question: You talk about the courage not to waste our gifts. What does this mean and how to do we do this? Response: What does it mean to have a gift? For the lamp, the light it was shaped to carry is its gift. Without a light, a lamp has no purpose. For a person, we are shaped by experience to reveal the light we carry. For a person, how that light comes through us is our gift. We could say that for every hand, the heart it was shaped to carry is its gift. And a life cut off from the work of its heart has no purpose. Our call in the midst of our days is to discover the gift that connects our heart and our hands, to discover the light that fills the lamp of the life we are given. Once discovered, our work is to never let the light of our gift go out. While I offer many stories and examples throughout the book, how we do this is a very personal practice we each must discover as we go. Question: You connect resilience with saying yes to life. Can you talk more about this? Response: In the face of this gritty, mysterious, and ever-changing dynamic we call being alive, it’s nothing short of heroic that we are asked to choose life and living, again and again. Not just to put a good face on things while we’re here, but because saying yes to life is how the worm inches its way through earth. It’s how salmon leap their way upstream. It’s how flowers grow out of stone. Ultimately, resilience resides in saying yes to who we are and giving our attention to whatever is before us. We are continually challenged to learn how to ask for what we need, only to practice accepting what we’re given. This is our journey on earth. As a way of being, saying yes is the ongoing dance of intimacy between our own nature and the nature of life. Saying yes is how Spirit keeps moving through us into the world. Question: You refer to faith as a trust in the nature of the Universe more than in a set of beliefs. How can we access this kind of faith? Response: When learning to swim, it’s natural enough to resist our initial sinking in the water. We seem to be going down. And the more we struggle at the surface, the stronger the pull seems, wanting to take us under. But when we can relax into the water, we settle a few inches into the miracle of buoyancy. Amazingly, the unseen depths hold us up. This moment reveals the essence of faith. Forget all the definitions and debates. It’s as simple and difficult as swimming in the ocean of experience and learning how to trust the unseen depths to hold us up. We don’t have to name that depth or send messages to it or pray in the dark to it. We simply have to surrender enough to feel its buoyancy. Yet these are the most difficult two inches to travel on earth. All the spiritual traditions offer us ways to practice this kind of surrender and deep attention to being alive. 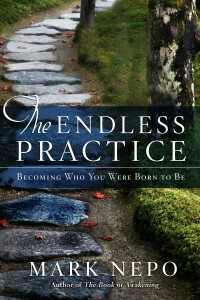 Question: What do you hope readers will take with them from The Endless Practice? Response: Every single being has an amazing, unfathomable gift that only meeting life head-on and heart-on will reveal. And we can’t fully know our gift alone. We need each other to discover the gift, to believe in the gift. And then, to learn how to use it. The challenge for each of us is not to discount our gift because of the indifference of others, and not to abdicate our gift because of the various weights we’re forced to carry. My hope is that readers will better know their own true nature and the depth of their own resources by being in conversation with this book and the inner terrain it opens, including how to restore our trust in life, when suffering makes us lose our way; how to begin the work of saying yes to life, so it can enliven us; and how to make our inwardness a resource and not a refuge.